Solar energy is rapidly increasing in popularity. Businesses in industries from homes to vehicles – even purses – are looking to harness the power of the sun to decrease dependency on fossil fuels and decrease pollution. With climate change and pollution becoming a greater concern and oil prices becoming increasingly volatile, solar energy acts as a promising alternative that is both clean and renewable. 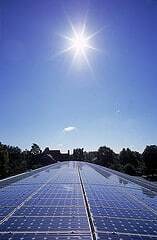 Although the use of solar energy, or photovolataics, is not as widespread in the U.S. as it is in Europe, the industry is undoubtedly growing1 The U.S. has currently moved up the ranks to the third biggest market for solar panels in the world trailing behind only Japan and Germany.2 In 2007 alone, photovoltaic equipment installations grew by 48%. Mounting concerns over energy prices, climate change, and national security have sent consumers, businesses and the government in search for a viable alternative to fossil fuels. Despite the high initial costs, consumers are eager to take advantage of government incentives and save money in the future by investing in photovoltaic systems. Businesses, both large and small, are eager to grab a portion of the market share and profits for this industry. The US government is determined to decrease and eventually eliminate our dependency on foreign oil. Solar energy refers to the conversion of solar radiation into electricity. The majority of solar systems use photovoltaic hardware. This technology utilizes a semiconductor, usually silicon, to generate a direct current from solar radiation. A common misconception is that on cloudy days solar panels will not work; however, a slightly cloudy day can actually yield even more energy than a cloudless one. There are two types of photovoltaic systems: grid-tied and off-grid. Off-grid systems use batteries to store electricity created. This type of system especially benefits rural areas and developing countries where initial capital costs present an obstacle for distributing electricity to isolated populations. Grid-connected systems are permanently connected to the electrical grid and can “feed” or sell excess electricity back to the network. Grid-connected systems are currently the largest market segment and are fueling market growth for the solar energy industry. They represent approximately 90% of all photovoltaic energy systems. According to the Solar Energy Industry Association, the U.S. has some of the best resources to sustain solar energy in the world.8 By the end of 2007, the U.S. had generated approximately 3,400 megawatts of solar electricity: 750 megawatts from photovoltaic systems, 418 megawatts of utility-scale energy, and 2,250 megawatts of solar systems. The U.S. now ranks third in the world for photovoltaic energy capacity with 750 megawatts, fourth for new capacity additions with 190 megawatts and fifth for manufacturing with 266 megawatts. Federal and state government incentives for renewable energy have been crucial in spurring the growth of the solar energy industry.10 Photovoltaic systems are costly, running anywhere from $16,000 to $45,000 for a residential application.11 Government tax cuts and rebates for those who install solar panels and other renewable energy equipment eases that cost barrier. 12 The U.S. Department of Energy’s Solar Energy Technology Program, headed by John Lushetsky, has a bold initiative: to increase solar electricity generation capacity from one gigawatt per year to at least 170 gigawatts per year by 2030.13 This amounts to a 26% growth rate over the next twenty years, creating much opportunity for manufacturers, suppliers and contractors in this industry. Residential photovoltaic installations account for over one-third of all grid-connected systems. In 2007 alone, 13,000 grid-connected systems where installed, 84% of which were residential applications; however, strong growth is expected in non-residential or commercial installations due to more generous tax credits and rebates.16The solar energy industry has the potential to create billions of dollars of income and investment to the U.S. economy. In addition, with legislation and incentives to stimulate demand in place, the solar energy industry can add as many as 62,000 new jobs by 2015. The future is bright for the solar energy and photovoltaic industry despite the harsh economic climate. The allure is understandable: unlimited, clean and renewable energy that is on track to be cost competitive with conventional energy. Demand for solar energy is trending upward, prices are trending downward and government and big business have boarded the bandwagon. However, what was perceived to be a “bulletproof” industry has recently shown itself to be vulnerable to recession. As a result of the tightening of the credit market, many green energy companies have found themselves scaling back production and cutting jobs. Banks are simply less willing to finance the installation of alternative energy equipment. Nevertheless, the industry remains confident about the long term outlook as the Obama administration remains determined to achieve its green energy goals. 14 “Photovoltaic Systems.” Encyclopedia of Emerging Industries. Online Edition. Gale, 2009. Reproduced in Business and Company Resource Center. Farmington Hills, Mich. Gale Group, 2009. Business and Company Resource Center. University of Texas at San Antonio, John Peace Library. San Antonio, TX. 17 Mar 2009.